Discover Bordeaux, Aquitaine's capital city known for its beautiful architecture and superb wines with this 5-day cruise. Excursions to Medoc and Saint Emilion are available on this cruise. 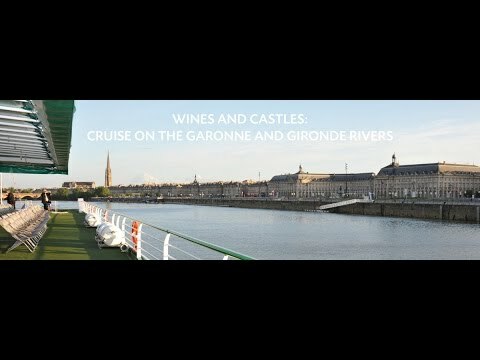 Explore the city of Bordeaux, Aquitaine's capital as you cruise along the rivers of Gironde, Garonne and Dordogne. On this cruise, you will the opportunity to vist Pauillac, Medoc, Blaye, Saint Emilion, Bourg or Libourne. Note: Price per passenger in double-occupancy cabin on main deck. This price can vary according to departure date, cabin deck, ship category and/or single-occupancy (additional fees). You are welcome to board the ship in Bordeaux at 6:00 p.m. After comfortably settling into your cabin, enjoy a welcome cocktail with the crew. Optional excursion for both packages: Guided tour of Bordeaux by night (reservation in advance is essential). Classic: Following the trail of the Grands Crus wines of Médoc, a renowned region where the most famous of all red wines in the world are cultivated. Discovery: Visit the Médoc through biking, wine and cheese. Get ready to discover the vineyards and châteaux of the region in this exceptionally beautiful area. You'll be rewarded for the effort with a lovely glass of grand cru* and some regional cheeses. Return on board for dinner and an evening of entertainment. Discovery Tour Blaye and its underground monuments on foot. After our tour, get to taste some regional products with an excellent glass of wine*. Return on board and cruise on the Gironde all the way to the estuary. Enjoy an evening of dancing. Cruise to Libourne, a town rich with history and full of character located at the confluence with the Isle and the Dordogne Rivers. Upon arrival, join for an optional excursion for both packages: tour of Saint-Emilion.Return on board in Libourne. Tonight is the festive gala dinner and evening. Cruise to Bordeaux this morning. Enjoy one last buffet breakfast on board before disembarking at 11:00 a.m. End of cruise. (1)Optional excursions. (2) Depending on the tide, stopover in Pauillac may be replaced by Cussac-Fort-Médoc and Libourne by Bourg. MS Cyrano de Bergerac is a beautiful, 5-star ship that cruises along the Gironde and Garonne rivers. MS Princessse d'Aquitaine is an elegant, 4-star cruise ship that sails on the Gironde and Garonne rivers.